A very quick blog, because I am about to leave these shores, but exciting plans are afoot and it would be silly to leave the country without letting people know about them. Here’s the first exciting plan, then: it’s my first feature film. And we’re going to make it next year. You will hear more about that in the months to come. Plenty more. It would have been nice to announce it with a little more ceremony, but as I said, I’m about to leave these shorts. Suffice it to say that it is going to be very, very exciting, and I am going to be very, very busy. Because feature films need funding and preparation and it’s always a good idea to have some kind of dry run for ambitious projects, this summer we are going to be making a short film which is, in ways that are difficult to describe but which may one day become clear, related to the long one. That also is going to be exciting. We are making it in August and you might in fact be able to help us, which is one of the reasons I thought I should blog about it before leaving the country. Maybe you’re an actor: fabulous, think about auditioning, won’t you? If you have experience of being part of a film crew, or want experience of being part of a film crew, we’d definitely like to hear from you. Or possibly you just live in a nice house and wouldn’t mind us filming in it for a couple of days – do let us know, because that will be much easier for us than buying our own. Otherwise, it may just be that you own a pair of traditional bedside lamps, an old office chair or a coat with a furry hood. We’re looking for some of those as well. 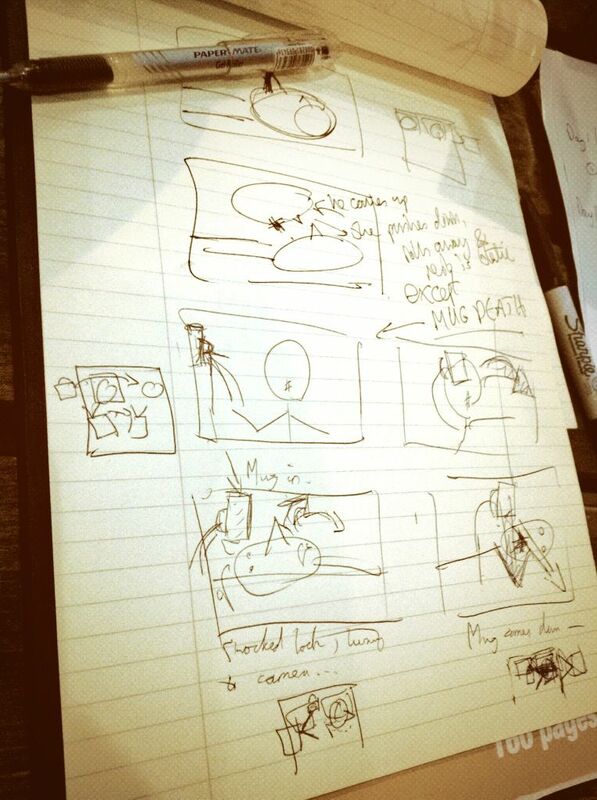 By now it should be absolutely clear what kind of film it is we’re making, so I’ll leave you with a glimpse of a hastily scribbled storyboard which features James Aylett’s oddly pointy noses and my improbable arm movements in a sequence which tantalisingly seems to have earned the title ‘mug death’. It really is going to be very exciting. ← Went the Day Welby?